In the sixties, Antonin Guyon then aged 55, buys plots of vineyard in a range of appellations covering the two hills from Gevrey-Chambertin to Meursault. After great efforts, his son Dominique manages to bring together in 1970 some 350 plots belonging to almost 80 different owners from the commune of Meuilley in the Hautes Côtes de Nuits: 54 acres facing south, an excellent soil finishing off the family range. 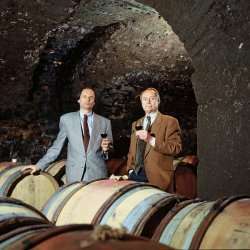 Today in their Savigny-lès-Beaune cellars, the two brothers look after the winemaking of more than fifteen different appellations. Together, Michel and Dominique take care of the administration and sales. With the help of Vincent Nicot, their vineyard manager and cellar master, Dominique conducts the vinification.